Notes: 1998 Tim Hills: An impressive tree consisting of 5 large trunks, the central 3 held together with a metal bar at about 20'. 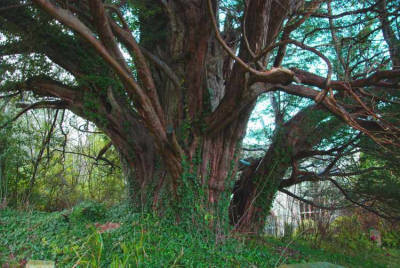 Latest information: 2012 Peter Norton: The massive female yew grows south of the porch, its girth 31' 1'' at 1'. Due to the nature of the tree the tape was slightly angled to obtain the minimum girth. One of its branches has recently snapped off and now lies close to the bole. Three of its five main areas of growth are banded together high up in the canopy while one of the remaining is hollow and partially blocked with flints, although a thick internal root can still be observed.